LEGO Store Grand Openings are always an incredible event. The store opening at 200 5th Ave, will provide a little something special because this will be one of LEGO's Flagship locations. There will be three LEGO Master Builders on site to help in the construction of a completely Brick Built 20-foot tall LEGO model of the Statue of Liberty. Usually this consists of you or your child building a small section of the model with the provided brick and then LEGO Staff or members of the local LUG (Lego User Group) taking that bit and adding it to the overall model. You'll be given a Certificate of Achievement for participating in the build. Historically with these openings, there will be a different exclusive offer on each day of the event. Normally, on day one there is a child's T-shirt given away with any purchase, on day two you can get a 3 Minifigure blister pack with custom printed torso denoting the store opening with a $50 purchase and on day three (and four in this case) the exclusive 3300003 : Mini LEGO Store set with $100 purchase. 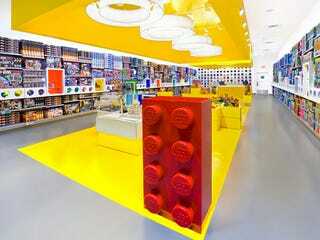 Because this is a Flagship store, there may be a custom LEGO model given away or available for purchase as well. Perhaps it will be the recently leaked 21023 : Flatiron Building. If they are utilizing the LUG to help with the event and you are a member, I would highly suggest getting out there to aid in the store opening. It'll be a long day of screaming children and irritated parents, but in the past LEGO has offered employee pricing for those assisting on whatever is left in the store after the Grand Opening event.